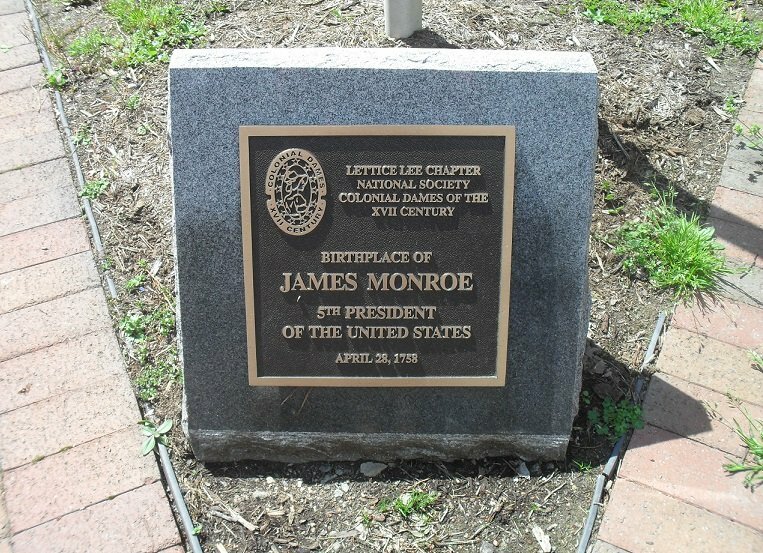 Annual Birthday Celebration - April 20, 2019 at 10:00 a.m.
UPDATE January 2017: Replica of James Monroe childhood home to be constructed. 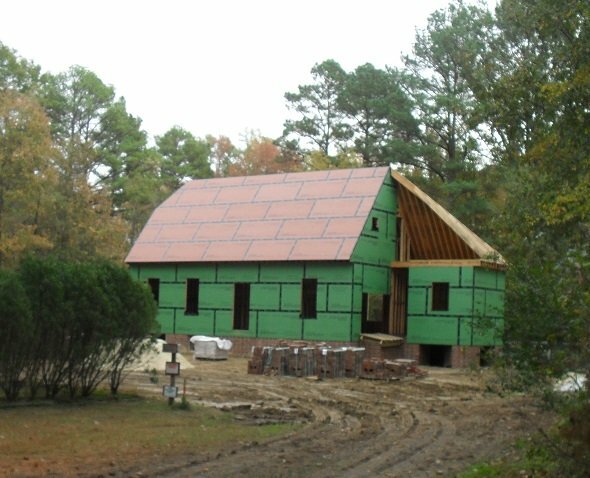 Replica of the Monroe Homestead under construction. 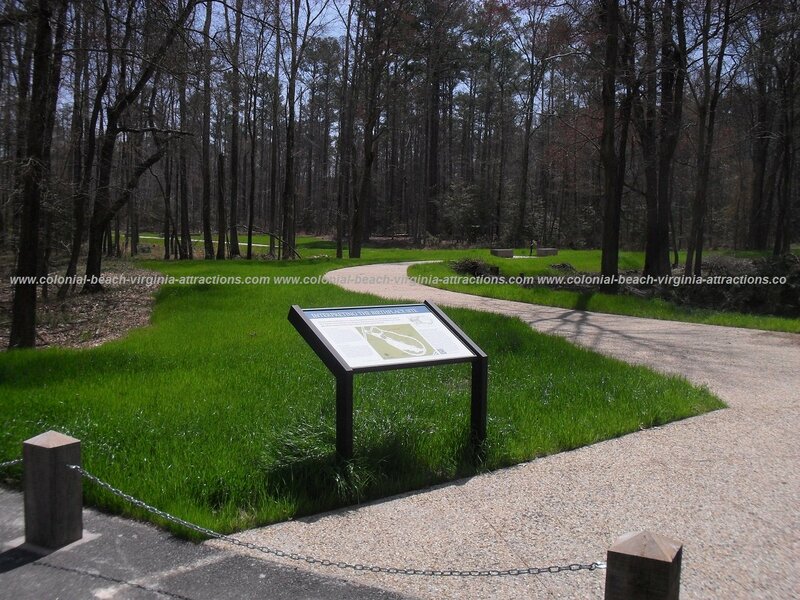 June 2016: VDOT approved a grant for construction at the James Monroe Birthplace site of an interpretive timeline. Plans are underway to construct a half-mile long, scenic historical walk! The Westmoreland County Board of Supervisors, working in conjunction with the James Monroe Memorial Association, the Federal Government and the Commonwealth, has approved plans to complete the James Monroe Historic Project, at a cost of more than $700,000. Soon to come are the scenic walk (complete with granite historical markers along the trail telling the story of Monroe’s career), a bicycle trail, a canoe launch, benches, an overlook and a picnic pavilion. in my American History class out on the west coast. 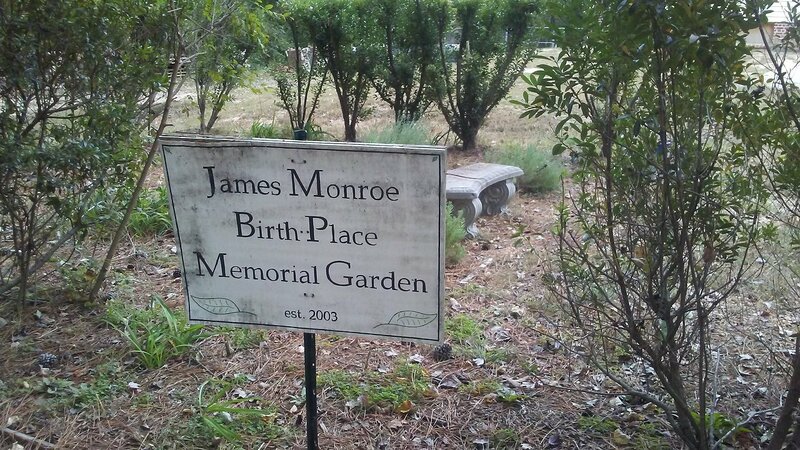 of the author of that program, former President of the United States, James Monroe. He was born here in Westmoreland County on April 28, 1758, within eyeshot of what was later to become the Town of Colonial Beach. 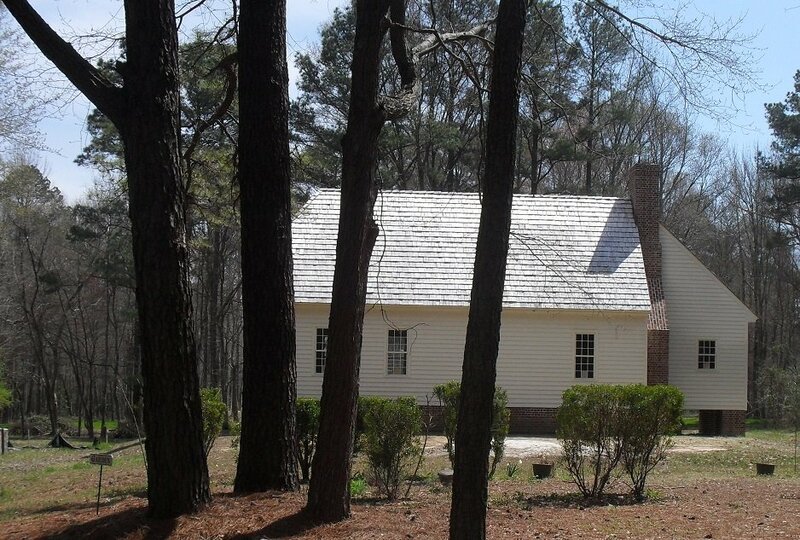 500 acres of land and a 20-foot by 58-foot four-room dwelling is not only where Monroe was born, but where he spent the first sixteen years of his life working the farm until he left to pursue an education at The College of William & Mary. It was that college who in 1976 began the archaeological survey of the James Monroe Birthplace and uncovered the ruins of the Monroe family home, a rough-cut wooden farmhouse with a few outbuildings. 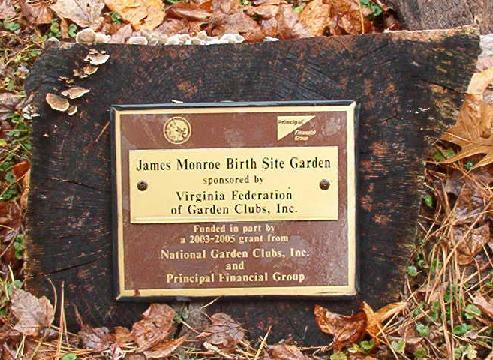 Laurence Gouverneur Hoes (great-great-grandson of James Monroe) and his wife, Ingrid Westesson Hoes, established the James Monroe Memorial Foundation back in 1928. Laurence had always hoped the Foundation would acquire the farm and reconstruct the Monroe family home, barn and outbuildings as an interpretive area to highlight the modest beginnings of a great United States President. On April 4th 2005, Westmoreland County signed a 99-year lease with the Foundation which will allow them to restore the Birthplace farmhouse, establish an educational visitor center, and remain the faithful steward of the Birthplace farm. The site was done-up recently, just in time for the 250th anniversary of his birth. What used to be a driveway and a flagpole now consists of a parking area, historical markers, and an 18th-century garden planted by members of the Virginia Federation of Garden Clubs. The Boy Scouts even built a canoe launch on the creek. So just who was James Monroe? A very underrated President who came from humble beginnings. 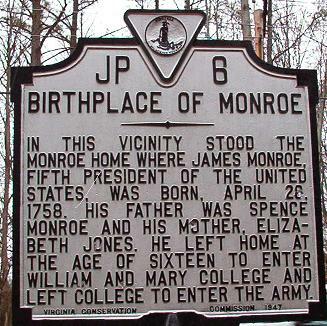 He was one of five children of Virginia natives Spence Monroe and Elizabeth Jones. At 16, Monroe entered the College of William and Mary. Shortly thereafter, his father died and his uncle, Judge Joseph Jones became his guardian and covered the cost of his education. In 1775, he left college to fight in the Revolutionary War. 1778 - He served with George Washington at Valley Forge, PA.
1779 - His military career came to an end after he achieved the rank of major and was commissioned to lead (as Lt. Colonel) a militia of Virginia regiment that was never formed. He became an aide to Virginia Governor Thomas Jefferson, as well as a law student with Jefferson’s guidance. 1782 - Monroe was elected to the Virginia State Legislature. At 24, he was the youngest member of the Executive Council. 1783 - Elected to the United States Congress that was meeting in New York City, he served for three years during which he became interested in the settlement of the “western” lands between the Allegheny Mountains and the Mississippi River. He chaired two expansion committees – one dealing with travel on the Mississippi River and the other involving governing of the western lands. 1786 - Monroe married Elizabeth Kortright, whom he met while Congress was meeting in New York City. He resigned from Congress and they settled in Fredericksburg, Virginia where he was elected to the town council and again to the Virginia Legislature. 1789 - The Monroe’s moved to Albemarle County, Virginia. Their estate, Ash Lawn, was very near Jefferson’s estate, Monticello. 1790 - Monroe was elected to a recently vacated seat in the United States Senate and was named to a full six-year term the following year. 1794 - Monroe accepted the diplomatic position of Minister Plenipotentiary to France and worked to help maintain friendly relations with them despite efforts to remain on peaceful terms with their enemy, Great Britain. 1796 - Monroe was recalled and he was bitter, feeling he'd been betrayed by his opponents who used him to appease France as they made great concessions to Britain in Jay’s Treaty which the United States two years prior. On his return he published a book of 500 pages, entitled "A View of the conduct of the Executive" (Philadelphia, 1797) in which he printed his instructions, correspondence with the French and U. S. governments, speeches, and letters received from American residents in Paris. 1799 - He was elected Governor of Virginia and served until 1802. The following year he was sent back to France to help Robert R. Livingston complete negotiations for the acquisition of New Orleans and West Florida. Emperor Napoleon I offered instead to sell the whole Louisiana colony and although the Americans were not authorized to make such a large purchase, they began negotiations. The Louisiana Purchase was concluded in April of that year, which more than doubled the size of the nation. 1807 - Monroe returned to Virginia politics and once again served in the legislature. 1811 - Monroe was elected Governor for a second time. 1812 - War was declared, and he loyally supported Madison, serving as Secretary of State during the war and simultaneously serving as Secretary of War in 1814. He scouted the British advance toward Washington from Benedict, MD, and was present at Bladensburg, where he ordered the movement of two regiments which he thought were deployed incorrectly. 1815 - Monroe returned to the normal peacetime duties of Secretary of State. He was the logical presidential nominee at the end of Madison’s second term, and he won the election easily. 1817 - March 4th, James Monroe took his oath of office. Some of the notable events of this term were: - Congress fixed 13 as the number of stripes on the flag to honor the original 13 colonies - The boundary between the U.S. and Canada was fixed at the 49th parallel - Spain ceded Florida to the United States in exchange for the cancellation of five million dollars in Spanish debt - The Missouri Compromise admitted Missouri as a slave state, but forbade slavery in any states carved from the Louisiana Territory north of 36 degrees, 30 minutes latitude. Monroe’s administration had been one of high idealism and integrity and his personal popularity was at an all-time high by the end of his first term in office. He was nearly unopposed for reelection, carrying every state and receiving every electoral vote cast - with the exception of one, cast by a New Hampshire elector for John Quincy Adams. 1824 - At 66 years old he had no intentions of seeking a third term. In 1825 he turned over the presidency to John Quincy Adams and retired to Oak Hill, his estate in Loudoun County. Plagued by financial worries, he was forced to sell his Ash Lawn estate. 1830 - Monroe's wife died, and he sold Oak Hill and moved to New York City to live with his youngest daughter, Maria and her husband. 1831 - Monroe died on July 4th in New York City on the 55th anniversary of the signing of the Declaration of Independence. He was originally buried in Marble Cemetery in New York, but on April 28, 1858 he was re-interred to Hollywood Cemetery in Richmond, Virginia. So, now, back to the Monroe Doctrine. This happened during Monroe's second term as president. The two principles of the Doctrine were noncolonization and nonintervention, which were not new or original, but it was Monroe who explicitly proclaimed them as policy and it was a keystone of foreign policy for many years. I'm glad that we studied it in school and I'm glad that I live not far from where this remarkable person and former U.S. President was born and raised. His wife, Elizabeth Kortright was born in New York city in 1768. She was the daughter of a British army captain Lawrence Kortright. Read a more comprehensive history of James Monroe here. Site Location: From Colonial Beach, take Rt. 205 east towards Oak Grove. It will be on your left after about a mile. Look for the "Road to Revolution" sign.